Introducing the stylish Pink and Purple Butterfly Collection set by Sweet Jojo Designs. This classic pink Butterfly Bedding theme will create a fresh spring-time look for your little girls room all year round. This set uses the color combination of Pink, Purple, Yellow, and Sage Green and is made using 100% cotton fabrics. 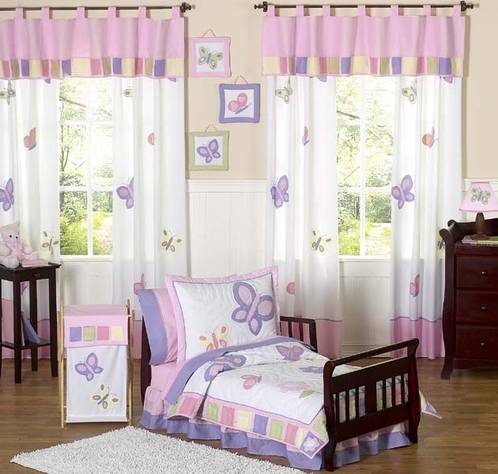 There are detailed embroidery works and appliques of butterflies and flowers to give this set a timeless designer look that is perfect for any girl�s room. The quilt is constructed in a flowering quilted design combining assorted butterfly and flower appliques. It is finished with a coordinating color block border. This matching sham combines these beautiful colors, and is also adorned with detailed butterfly appliques. Included also is the matching 3 pc. pink 100% cotton sheet set with purple trim. This is the perfect finish to any pink butterfly bedding set. This Set does not come with the bed skirt, but the bed skirt may be added - please see related items. I think this would be a perfect gift for moving a toddler to a big girl bed. It may help her feel like a REAL big girl. My daughter has this and we all LOVE it! the colors and design are lovely and calming and the quality is wonderful. I wish she would never grow up and would want to keep this forever- the only issue is as they become pre-teen they will grow out of the design. I love this set! My daughter's face lit up with a smile when she saw this product. The colors are vibrant and beautiful. This is a set that will never grow old!